A co-worker recently told me that his bike had gotten stolen. He locked his bike to a common area which was also monitored by cameras, but it did very little to prevent the theft anyways. Now, when you work with technology everyday that can locate your car using your smartphone, this kind of personal event can really be an annoyance. We also work in a city which strongly encourages riding your bike as a method of transportation. So, my co-worker and I tossed around some ideas at lunchtime on bicycle theft prevention systems. Wouldn’t it be neat if we could locate your bike or even get a notification on your smartphone if your bike has been moved? What if we just had a small, inexpensive deterrent on your bike handle bars – a hair wrap for instance – that stood out from the other bikes? It might indicate “Theft Location Detector” on it or some other visible warning to would-be thieves. A simple deterrent which would make that would-be thief move on or look elsewhere. Here comes the Tech Galavant, because I think I’m technically competent to either develop a solution or have friends who can help come up with one! Before embarking further, it’s always a good idea to do a little research. What exists already for bike deterrent systems and does it fit my basic criteria? I discovered that theft deterrent systems for bicycles exist, but they were either ultra expensive or were easy to disable. One of the better solutions that I found was still an Indiegogo project (https://www.indiegogo.com/projects/connected-cycle-pedals/#/story). The tracker is located inside your pedals, and it also kept task of your riding stats. A clever idea! A thief who tries to break the pedals off the bike will also be unable to ride it! A significant problem was the cost: $189. It’s very cool, but too expensive. I paid around $200 for my bike, and there’s no way I can convince my wife that I should spend another couple hundred bucks for a theft deterrent system! I was thinking of a product which might cost $3 to build and could be sold for under $20. I did a little more trolling around the internet and found a product for $12 on EBay. 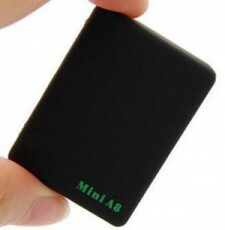 A mini GPS locator that is a little larger than a SIM card, and in fact, requires a SIM card to use it. This thing is so small that it could get dropped down inside your seat’s tube shaft or get secretly attached to the bottom of your bike seat. The manufacturer is based in Taiwan and indicated that a simple pay-as-you-go GSM SIM card would work fine with this. A little more research on pay-as-you-go SIM plans and I learned that these were very inexpensive, too. Most of the large phone carriers have partnerships with these smaller, pay-as-you-go businesses. For instance, AT&T, the leading national carrier, owns AirVoice Wireless, which apparently offers some of the cheapest plans. What that means is that if your device needs a cell tower to transmit data, then by selecting this company’s product, you should conceivably have a reliable network connection in most parts of the U.S. I could buy 250 minutes to be used at anytime and pay just $5 (they’ll give the SIM card to you for free). Now we’re talking! $12 for the mini GPS tracker and a $5 phone connection, and my cost is $17. I haven’t negotiated cost with anyone, but I’m already under $20. I need to evaluate these items, though. I believe that I can convince my wife that the $17 is an inexpensive research cost. The GPS tracker is coming from Taiwan, and it will take about a month to arrive, so I go ahead and order it. Hey! If you want to help out with this project, please let me know!